This is really easy; it comes together in about 10 minutes. I often cover it in kirsch-flavored whipped cream, but lately I have been baking it instead with a topping of pecans caramelized in butter and brown sugar. 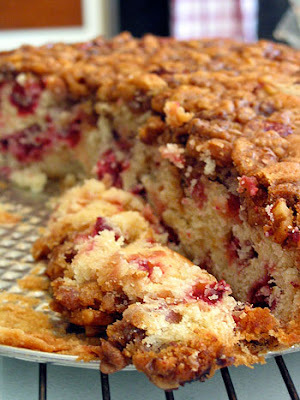 The nuts make this rather fruitcake-like - a fruitcake for non-fruitcake eaters. Preheat oven to 350°F. Lightly grease a 9x13 pan or a 10" springform pan. Bake 45-50 minutes for a 9x13, or a little over an hour for the springform. You made need to tent the cake with foil in the last 15 minutes or so to keep the top from browning.